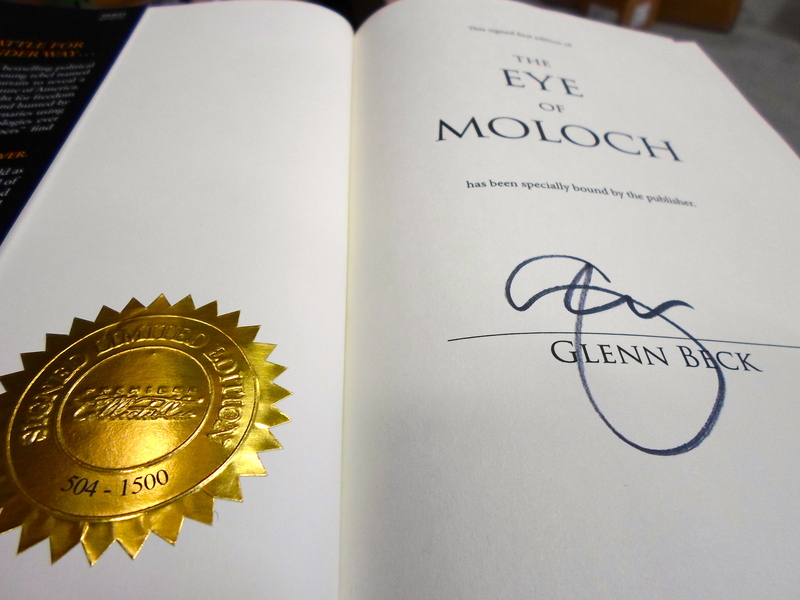 This Autographed Hardcover First Edition of The Eye of Moloch has been personally Autographed & Numbered by Glenn Beck. Exclusively Made Available at PremiereCollectibles.com. By the end of Glenn Beck’s #1 bestselling political thriller The Overton Window, a young rebel named Molly Ross had torn aside the curtain to reveal a shadow war being waged for the future of America. In the six months since then, her fight for freedom hasn’t gone well. Marked as traitors and hunted by ruthless government-sanctioned mercenaries using the most advanced surveillance technologies ever created, Ross and her “Founders’ Keepers” find themselves cornered and standing alone. but the fight is far from over. The battle lines in this bitter rivalry are as old as civilization itself: On one side, an unlikely band of ordinary Americans ready to make their last stand in defense of self-rule, freedom, and liberty—and on the other, an elite cabal of self-styled tyrants who believe that unlimited power should be wielded only by the chosen few. That group, led by an aging, trillionaire puppet-master named Aaron Doyle, will stop at nothing to destroy the myth that man is capable of ruling himself. As Doyle prepares to make his final move toward a dark, global vision for humanity’s future, new allies join the fight and old enemies change sides. In the midst of it all, Molly draws together a small but devoted group willing to risk their lives to infiltrate one of the most secure locations on earth—a place holding long-standing secrets that, if revealed, would forever change the way Americans view their rare, extraordinary place in history. Exposing these truths, and the real-life game of chess being played for mankind’s freedom, is their last chance to save the country they love. Glenn Beck, the nationally syndicated radio host and founder of The Blaze television network, is a ten-time #1 bestselling author and is one of the few authors in history to have had #1 national bestsellers in the fiction, nonfiction, self-help, and children’s picture book genres. His #1 novels include The Overton Window, The Christmas Sweater, and The Christmas Sweater: A Picture Book. His #1 nonfiction books include Cowards, The Original Argument, The 7 (with Dr. Keith Ablow), Broke, Glenn Beck’s Common Sense, Arguing with Idiots, and An Inconvenient Book. His other books include the national bestsellers The Snow Angel, Being George Washington, and The Real America. Visit GlennBeck.com or TheBlaze.com.